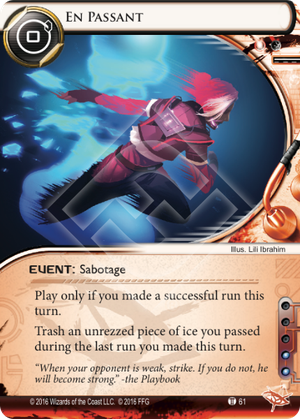 Can the Runner play En Passant to trash a piece of ice that was passed while rezzed and then subsequently derezzed by another card ability (e.g. Emergency Shutdown or Golden)? Yes. En Passant trashes an unrezzed piece of ice, regardless of the situation in which it was passed earlier in the turn. Level 1: It's a chess thing! Reina has a chess theme! Perfect. Level 2: En passant is French for "in passing". So of course it works on passed ICE. Level 3: En passant is a special chess move that allows you to capture a pawn. It gets a piece off the board. This card gets an ICE off the board. Level 4: Pawns usually plod forth one space at a time (just like the program of the same name). But they have a special ability where the first time they move, they can move forward two paces. Without the en passant rule, this would allow a pawn to avoid an interaction with an opposing pawn. Even though the pawn moved two, the en passant rule lets the opponent capure the pawn as if it moved one. For clarification, there's a nice animation showing a white pawn capturing a black pawn here. What does this have to do with the mechanics of Android: Netrunner? I will tell you. When a runner approaches a piece of ICE, the corp has the choice to rez it, and have the runner encounter it, or not rez it, and then the runner does not encounter it. Not rezzing it is avoiding confrontation. En Passant, the card, allows the runner to interact with an opposing card after the corp opted to avoid a confrontation. I am excited for what this means for future Reina cards. Very happy with Queen's Gambit. More chess terminology to follow? Will we see Castling? Forks? Pins? Fischerandom?! If we do, think of me, because I will be excited. DDoS, installed the turn before, allows you to trash two, TWO ice for a three credit buy in. And you got some successful runs out of it to boot. Good stuff. Run Amok and En Passant is a hilarious combo. Run Amok into their one iced server for free access (or the ice kill, either way is a win for you), and next click kill that same ice they were so keen on keeping installed. Talk about a one-two punch. Emergency Shutdown and En Passant. Not the most graceful combo, but in case there's a big piece of ice you really need to destroy, this does the job very well. If said ice is installed on HQ, it gets even better, and requires one less run. I could definitely see some runners who don't care about tags using Account Siphon, then Emergency Shutdown, and then En Passant, which is a one-two punch with a sucker punch to the groin thrown in for good measure (the true Anarch way). One thing to note, which only makes this card even stronger, is that the successful run you have to make DOES NOT need to be the same run in which you passed the unrezzed ice you want to destroy. So you can definitely get a free, easy run on Archives, then pass an ice on R&D, bounce off the ETR ice after that, and then En Passant. There's a lot of cool possibilities with this card. Attack of the Birbs! Peck those sysops' eyes out! I think that if a deck built around the Birds' derez abilities crops up (which from some of the Red Sands Cycle spoilers, looks like it might... assuming that people care about ice again at that point) then this would be a rather reasonable splash to make; as you can de-rez and trash a piece of ice with this, without giving them the opportunity to rez it again. But to be honest, it's probably going to see more play with things like Blackmail and DDoS instead.